Offering you a complete choice of products which include plastic push button switches, push button switch and small push button switches. Available Color Red, Blue, Yellow etc. 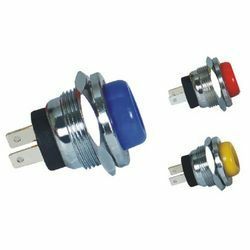 Our excellent assortment of push button switches have attained huge acknowledgment among our customers due to their durability, efficiency and reliable performance. These switches are provided in different specifications and can also be customized if the client requires. We ensure best quality as they are manufactured in compliance with the industry norms. Our push button switches are extensively used in various modern electronic applications.